For many customers, the first thing they see when coming to a new place of business is the parking lot. A well-maintained parking lot presents a positive face for the business. It gives customers a positive first impression of the professionalism of your company. Alternatively, a disheveled, hard-to-navigate parking lot is not so welcoming. As the business owner, you want to put your best foot forward and provide a safe, easy-to-maneuver environment for customers. That’s why asphalt marking and parking lot striping are essential for all commercial properties. What is Parking Lot Striping? Parking lot striping or re-striping is an essential maintenance task for every commercial business. 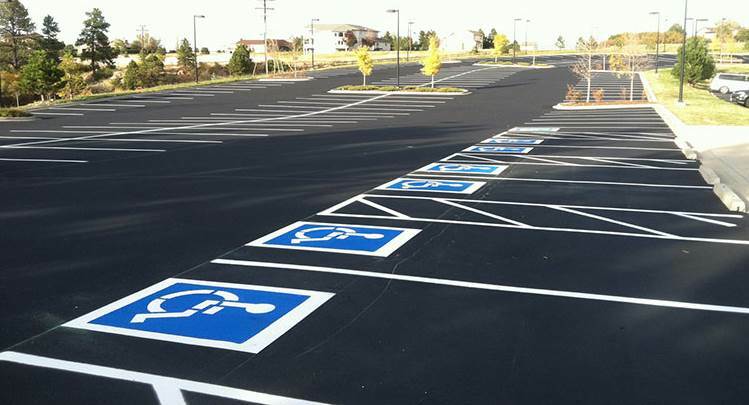 It’s the process of correctly painting lines throughout your parking lot that gives customers proper directional signals —think parking spaces, handicapped parking spots, no parking zones, and fire lanes. At Asphalt Advanced Services we are experts in asphalt striping and parking lot layouts. When you call us for asphalt striping or a re-striping project, our team will work directly with your facility manager to determine the best way for your parking lot to be structured. We can help you decide if you should keep the same lines, when you’re re-striping, or if a new layout would better accommodate the needs of your customers. Why is Asphalt Striping Important and When Do You Need It? Asphalt Striping is important for two main reasons—aesthetics and safety. Well-marked lots help traffic flow. When parking lot lines are well-marked on your pavement, cars know how to move efficiently in the parking lot—this means they can spend more time in your place of business and less time in traffic jams. Plus, fresh lines reflect well on the overall quality of your business. Need asphalt services in Colorado Our team is dedicated to providing you excellent customer service with above and beyond results. Our affordable pricing and quick turnaround time is why your friends, neighbors, and local businesses consistently choose us for all of their asphalt work. Why Choose Asphalt Advanced Services For Your Asphalt Striping Project? We pride ourselves on quick turnaround times and affordability—so you’ll always pay a fair price with us. In addition, we also make sure that your parking lots are compliant with the Americans with Disabilities Act (ADA) standards—adding the correct number of accessible stalls based on the size of the parking lot. With our one-year warranty on all asphalt work, you can rest easy knowing you’re working with a team that guarantees quality. Since 2008, we’ve been proudly providing asphalt sealcoating and asphalt paving services to clients in Fort Collins, Longmont, Boulder, Castle Rock, Monument, Colorado Springs, Woodland Park, Pueblo, Breckenridge, Summit County and the surrounding areas. Might extend on this a bit futher.